Nearly 3 billion people in low- and middle-income countries rely on traditional cookstoves fueled by biomass, such as wood and dung, to cook and to heat their homes. Traditional cooking leads to high levels of household air pollution (HAP), including black carbon, which contributes significantly to climate change. Exposure to smoke from HAP causes 3.8 million premature deaths each year, including more than 1 million deaths in India. Improved cookstoves (ICS) that leverage fuels such as pellets and other biomass, electricity, and liquefied petroleum gas (LPG) are cleaner alternatives. Sadly, low uptake of ICS by intended users has blocked progress in the sector. A variety of barriers impede clean cookstove adoption, including stove designs that fail to meet the needs of rural women, limited financing options, equipment that is not user-friendly, a lack of after-sales service at the last mile, and a market model that is not sustainable for rural energy entrepreneurs. We can’t fix problems we can’t see. 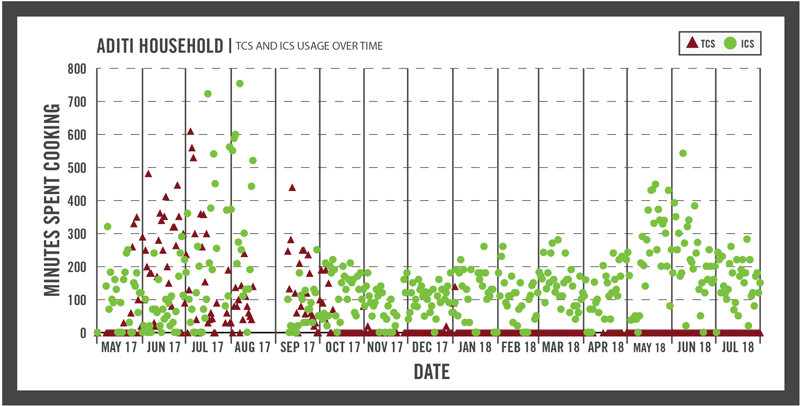 If we do not track adoption of improved cookstoves continuously over time, stakeholders have little to no insight into ICS performance, user acceptability, or when design solutions are required to address these barriers.